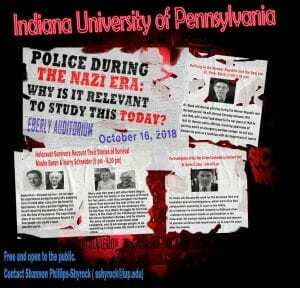 Police During the Nazi Era: Why Is It Relevant to Study this today? Fine Arts Event for HNRC 101 and HNRC 201. Mark your calendars! 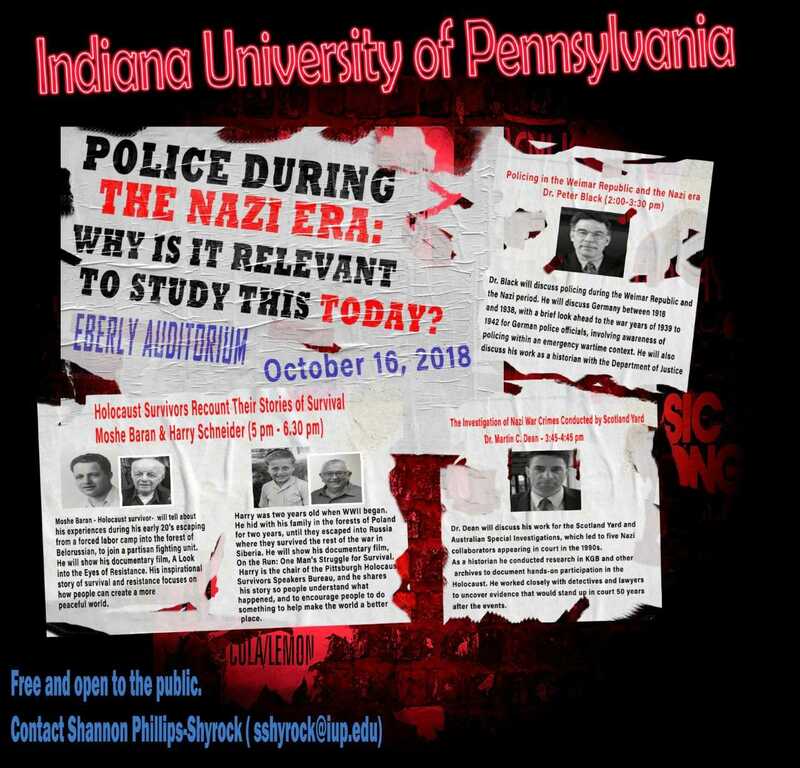 Attend an unique educational program titled, Police During the Nazi Era: Why Is It Relevant to Study this today?, on October 16, 2018 beginning at 2 pm. This program will include Holocaust scholars Dr. Peter Black and Dr. Martin Dean, and Holocaust survivors Moshe Baran and Harry Schneider. Location: IUP campus, Eberly College of Business and Information Technology Auditorium, 664 Pratt Drive, Indiana, PA 15705. Dr. Black will discuss policing during the Weimar Republic and Nazi period. He will discuss Germany between the years 1918 and 1938, with a brief look ahead to the war years 1939-1942 for German police officials, involving awareness of policing within an emergency wartime context. Dr. Black will also discuss his work as a historian with the Department of Justice. Dr. Dean will discuss his work for the Scotland Yard and Australian Special Investigations, which led to five Nazi collaborators appearing in court in the 1990s. As a historian he conducted research in KGB and other archives to document hands-on participation in the Holocaust. He worked closely with detectives and lawyers to uncover evidence that would stand up in court 50 years after events. Attendance vouchers will be available. Please encourage your students to attend. I hope you can join us for this important training! Moshe Baran – Holocaust survivor, Moshe Baran, will tell about his experiences during his 20’s escaping from a forced labor camp into the Belorussian forest, to join a partisan fighting unit. He will show his documentary film, A Look into the Eyes of Resistance. His inspirational story of survival and resistance focuses on how people can create a more peaceful world. Harry Schneider – A child Holocaust survivor who hid in the forests of Poland and Russia, Harry Schneider, will discuss his experiences during the Holocaust related to this topic. He will show his documentary film, On the Run: One Man’s Struggle for Survival. Harry is the chair of the Holocaust Survivors Speakers Bureau in Pittsburgh. He is passionate about sharing his story so people never forget, and to encourage them to do something to make the world a better place. Martin Dean, born in London in 1962, received a Ph.D. in European History from Queens’ College, Cambridge. He worked as a researcher for the Special Investigations Unit in Sydney, Australia, and Senior Historian for the Metropolitan Police War Crimes Unit in London. As an Applied Research Scholar at the United States Holocaust Memorial Museum (USHMM) in D.C., he was a Volume Editor for The Encyclopaedia of Camps and Ghettos. His publications include Collaboration in the Holocaust (2000) and Robbing the Jews (2008), which won a National Jewish Book Award in 2009. He is based in Washington D.C. and currently works as a Historical Consultant for Babi Yar Holocaust Memorial Center and a film documentary advisor. Peter Black was the Senior Historian and Director of the Division of the Senior Historian at the United States Holocaust Memorial Museum (USHMM) from 1997 until his retirement from federal service on January 2, 2016. During his tenure as Senior Historian at the USHMM, he was involved in developing training materials and presenting training sessions for law enforcement agencies and agencies of Federal civil service. From 1978 until 1997, he served as a staff historian and (after 1986) as Chief Historian for the Office of Special Investigations (OSI), Criminal Division of the United States Department of Justice. The OSI was charged with the investigation of and, if appropriate, litigation against alleged Nazi offenders living in the United States. He is now active as an unaffiliated historian/consultant. Educated at the University of Wisconsin (BA: 1972) and Columbia University (Ph.D. in 1981), Dr. Black, has held various teaching positions at George Mason University, Catholic University, American University, and Columbia University. He is the author of, Ernst Kaltenbrunner: Ideological Soldier of the Third Reich (Princeton: Princeton University Press, 1984), as well as many articles.